With facilities overpopulated for current capacity and continued demand, this is the right time to make this incredible project a reality.​ The driving force behind this expansion is mission focused on our belief that every child who wants a camp experience should have the opportunity. YMCA camps are the highest impact youth programs in the national Y system due to their focus on the healthy development of young people in 3 core areas; achievement, belonging, and relationships. YMCA Camp Weaver is your partner, standing with you to strengthen our community. Our Annual Giving Campaign provides scholarships for deserving kids to experience the magic of summer camp and to participate in valuable outdoor education opportunities. Your support helps hundreds of youth live healthier and happier lives and ensures that YMCA Camp Weaver’s doors are open to all regardless of ability to pay. Help us spread the word about camp to help our annual campaign grow. Below we have identified levels for your capacity to give. Giving on any level is desired and appreciated. We welcome you to become one of many Proud Donors of the Children. Amazon Smile: Use this link every time you shop at Amazon.com and .5% of qualifying purchases will be donated to the YMCA of Greensboro’s Camp Weaver Annual Giving Campaign! Please consider bookmarking the link and be sure to share with your friends and family. YMCA Camp Weaver is honored to establish a scholarship in memory of American Hero, Lt. J. Wesley Van Dorn, United States Navy who passed away in a helicopter accident off the coast of Virginia. Wes loved people and was an avid outdoorsman. Donations can be made by clicking the link above or sent by mail to YMCA Camp Weaver, Lt. J. Wesley Van Dorn Scholarship Fund, 4924 Tapawingo Trail, Greensboro, NC 27406. Each week during the summer around 300 kids get to form life-long friendships, set and reach goals, and try new activities at YMCA Camp Weaver. YMCA Camp Weaver provides $50,000+ in scholarship money each summer to children in need so that all youth in our community have the opportunity to participate in enriching summer programs. This is just one of the many ways YMCA Camp Weaver helps to develop the potential of children. 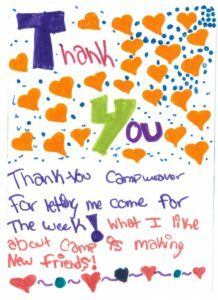 If your child loved camp this summer, please say thank you to your child’s favorite counselor by making a gift to Camp Weaver’s “Send a Kid to Camp” Campaign in their honor. When you honor your child’s counselor with a gift to the “Send a Kid to Camp” Campaign, you are ensuring that all children are able to have a life-changing camp experience. Gifts of any amount are greatly appreciated and are 100% tax deductible. An acknowledgement of your gift will be sent to the counselor. Donor Stories- Share why you give!